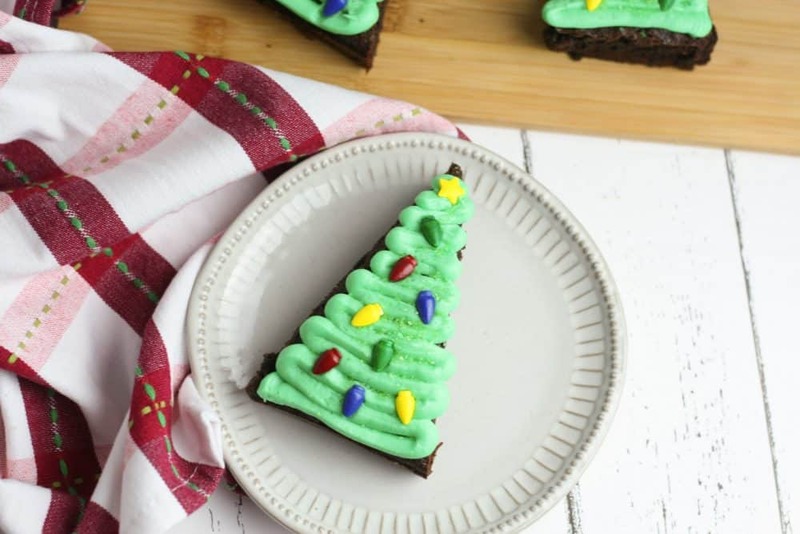 Christmas Tree Brownies are a fun and simple treat to make during the holiday season. Plus they look great sitting on any dessert table along with our Reindeer Cupcakes, so they make a fun treat to bring along to any holiday gatherings you get invited to as well. 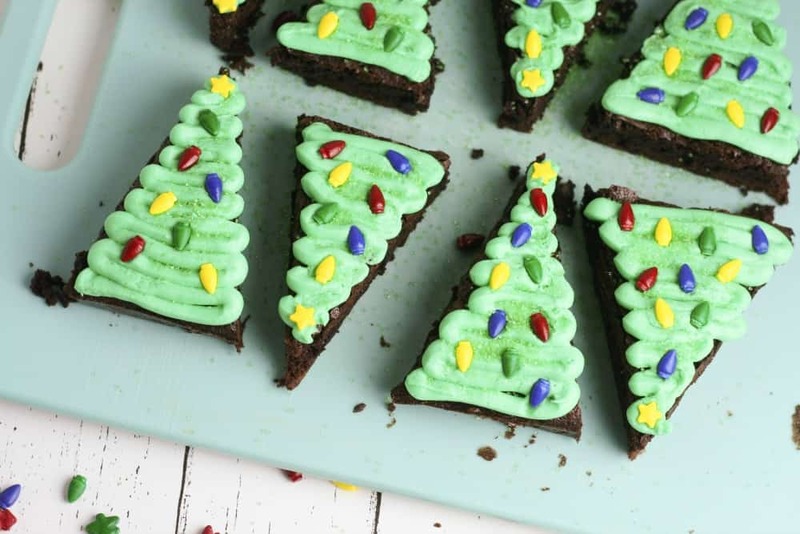 I have seen other Christmas Tree Brownies when I was searching for holiday recipes on Pinterest, but they all seemed to use pre-made brownies. So I thought to myself why couldn’t we just do the very same thing using any homemade brownie recipe that you love? We love to add chocolate chips to our brownie mix before we stick it in the oven to bake. I also like to add a drop or two of peppermint vitality essential oil. It is so good and has a way of infusing the chocolate chips so that every bite give you some mint chocolately goodness! Saving Dollars and Sense Tip: The FDA provides a list of GRAS (generally regarded as safe for consumption) products. the Vitality oils are GRAS. I would not feel safe using any other brand in my food. Use any brownie recipe that you love and bake brownies in a square pan. Prepare your own homemade or boxed brownie mix in a large bowl and add to prepared pans to bake. Bake brownies according to package directions or your own homemade recipe in a square baking pan. Allow to cool completely, then carefully remove brownies from pan and place on a large cutting board. 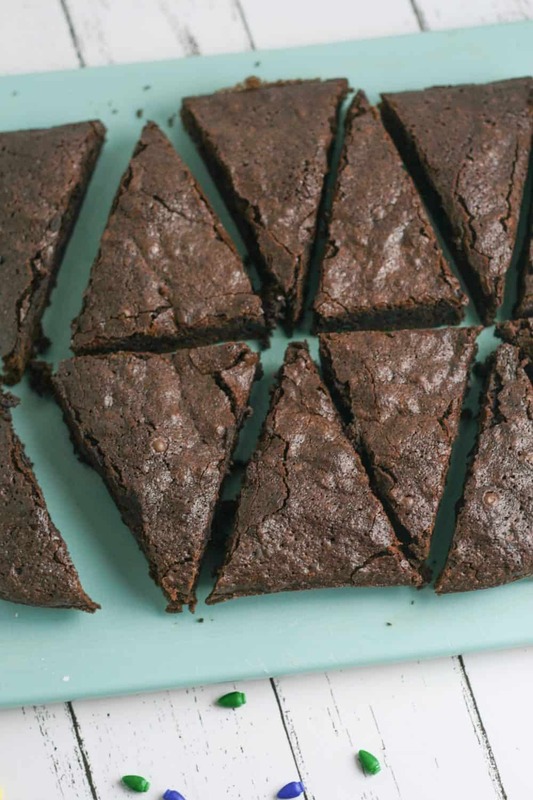 Using a sharp knife, cut the brownie in half, then cut triangles out of each side. Discard the four edge pieces. By “discard” what I mean is eat the leftover pieces while you are preparing to decorate the “tree pieces” that you just cut out. Prepare your icing by mixing green food coloring into the pre-made vanilla icing until desired color is reached. Place icing in a piping bag or zip top storage bag (you’ll have to cut one of the corners to turn it into a piping bag). Pipe icing onto each brownie. 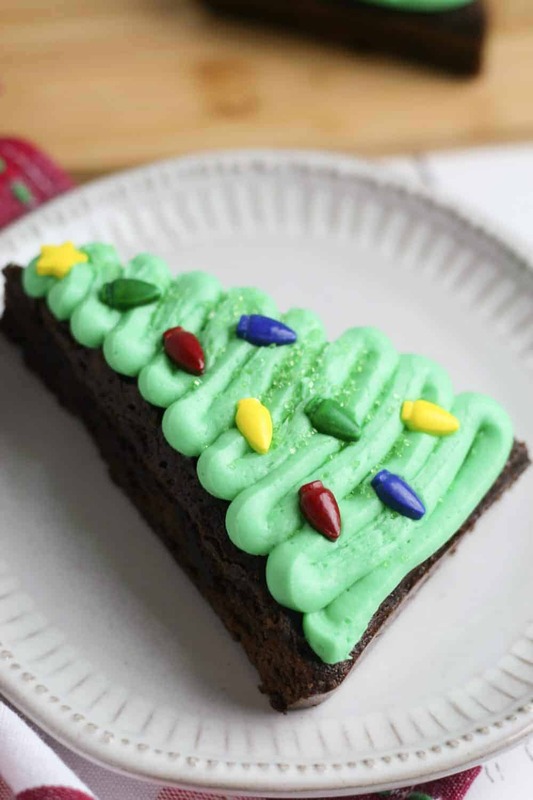 These Christmas brownies would go perfectly with a nice mug of hot chocolate with mini marshmallows and a peppermint candy cane to stir it. 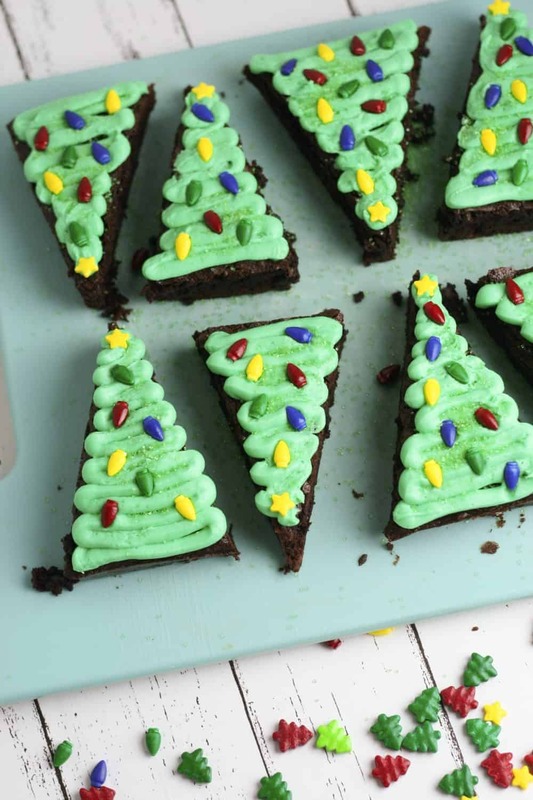 Here are some more fun holiday recipes that kids will love! Chocolate & Peppermint Grahams – these are great and can easily be used to make some amazing s’mores too! Homemade Frugal Christmas Candy – I picked up this recipe a couple of years ago and it has become a Christmas tradition to make it every year since. It is super easy and cheap! Peppermint Hot Cocoa Cookies – This recipe would be a great one for Christmas Cookie Exchange Parties too! 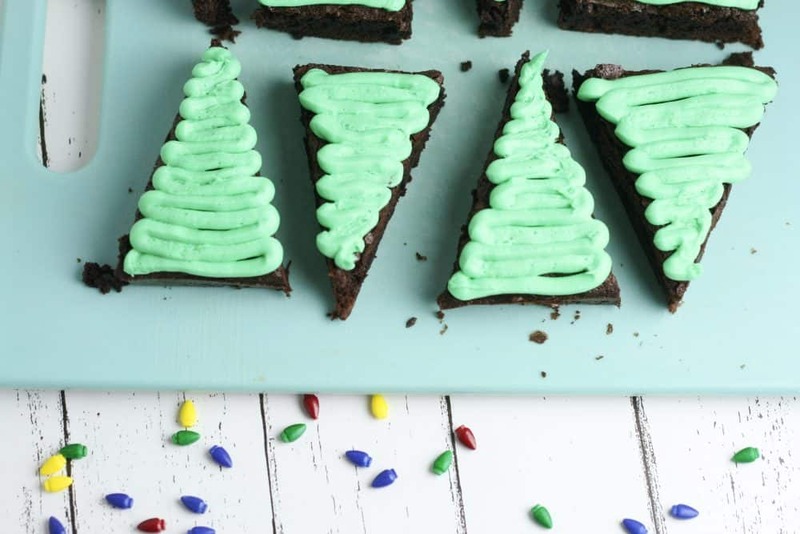 Chocolate Christmas Trees – So much fun to make these with your kiddos! Melted Snowman Cookies – How fun are these! Snowman Cupcakes – These are great for the holidays and all winter long. Peanut Butter Kisses Cookies – I loved making these with my kids when they were little. They loved unwrapping the kisses and being able to stick one on each cookie as it came out of the oven. Copycat Thin Mint Cookies – These are just like the real thing you guys! Oreo Strawberry Santa Hats – These are so simple that kids will love making them themselves. Disney Christmas Sugar Cookies – Disney fans of all ages will love this one! Easy Snowman Cupcakes – These cupcakes would be so fun for kids to decorate on a snowy day. Christmas Lights Sugar Cookies – These cookies are absolutely adorable and SO EASY to make! Melted Snowman Bark – It’s just like making a real snowman, but with candy and pretzels instead.